Equatorial sundial displaying any standard time in the world. Global position of the Sun on integrated world maps. World maps made from acrylic glass. “But it does move“, the Italian physicist, mathematician, philosopher and astronomer Galileo Galilei is supposed to have murmured, when he was forced to renounce the Copernican system at an advanced age, standing before the Inquisition. In the meantime, Galilei has been rehabilitated by the church. Today, we know without a doubt that the Earth revolves around the Sun and around its own axis, which points toward the Polaris. Equatorial sundial displaying any standard time in the world. Display of global position of the Sun on integrated world maps. World maps made from acrylic glass. For latitudes 35°N-70°N and 35°S-70°S. The base plate is a useful addition to the POLARIS. 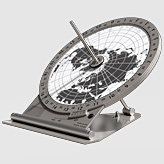 It enables you to level the sundial horizontally and position it towards the south. The POLARIS is placed into the grooves provided for this purpose. A solid surface (concrete, stone or similar) is suitable for mounting the sundial.